I might get flack for this... but I didn't enjoy this book. I know it's classic. I know a ton of people say this is their favorite book. I know it's supposed to be hilarious. I read the entire thing. I stuck with it. I really did. I wanted to like this book a lot but in the end I couldn't. I don't want to try to analyze and pick it apart. I just needed to get this little complain-fest out of my system so that I can move on. I'd actually be really interested to hear what people like about this book. Please, if you disagree with me, leave a comment and let me know why. Does this series get better? Is there a different book of his that I should try reading? Seriously, help clue me in. 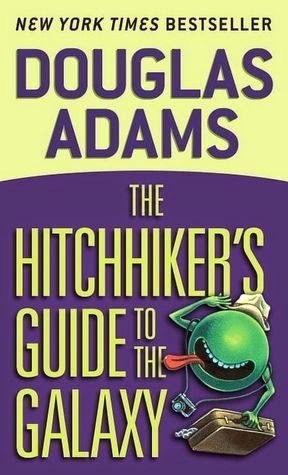 What's the deal with Hitchhikers Guide to the Galaxy? Why is it so loved? I have only read excerpts of the book and others in the series. None of them caused me to want to read the books. I have heard that it may just be a humor style thing; some like his humor and some don't. I do wonder if that is some aspect of the books that is just totally eluding me. I'd like to see comments from those who really like the books to help clue me in too. I read it once as a teen. Didn't dislike it, but also didn't see what all the fuss was about. I also read books 2 and 3, but just couldn't get into 4. Same deal with 2 and 3, though -- I didn't dislike them, but didn't see what the fuss was about. I've never re-read them. I ended up reading the whole series, but I agree that it was... let's just say a bit overblown. Everything with Arthur was great. Anytime Zaphod appeared, my eyes glazed over. I think it was probably more groundbreaking for its time than a classic per se, and the memes it created have simply propelled it into posterity. I did enjoy Adams' other works though. But I do suppose they are not everyone's glass of pan galactic gargle blaster!